Ticking a major item off the old bucket list is the best feeling ever. Cage diving with Great White Sharks has been hovering at the top of my list for ages. I’ve tried before in both the Farallones in Northern California and South Africa with no luck. The first trip, the sharks were a no show and in South Africa, the weather was too rough. So, Guadalupe was going to be my third attempt. We, (my husband, son, a buddy and I), met up in San Diego the first day of the trip and boarded a big bus with a giant Great White Shark painted on the side. 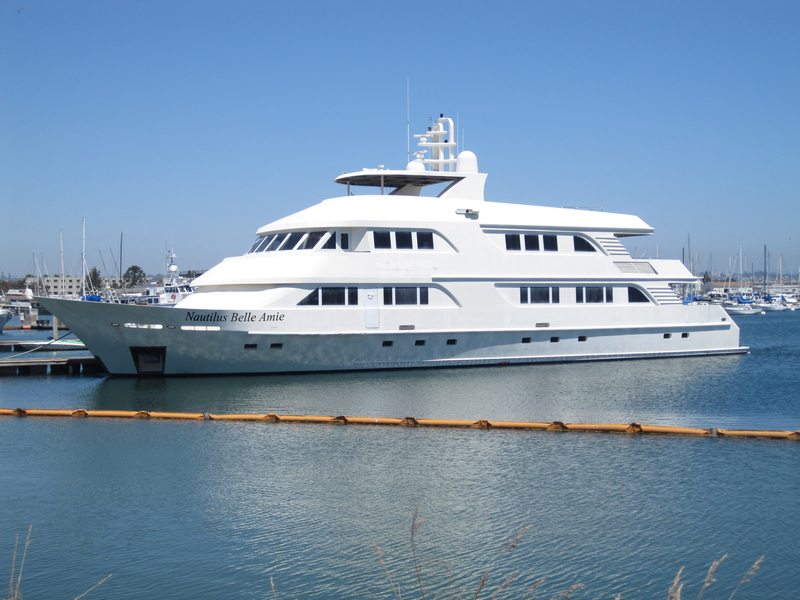 We were off to Ensenada, Mexico to board the Nautilus Belle Amie for a 5 night journey out to the island. When they put Jaws on the TV on board the bus, I instantly knew this was going to be a fun trip. It took a couple hours to reach Ensenada with an easy passage over the border. It was late when we boarded so it was a quick snack, welcome drink, brief briefing to meet the fabulous captain and crew, and off to slumber land. The overnight journey to Guadalupe was calm and took about 18 hours. We had downloaded lots of old shows to watch during the trip, but ended up not watching any. Instead, we played games with the other passengers, watched goofy movies in the lounge, got our gear in order, relaxed up on the top deck, watched pods of dolphins and got to know our fellow passengers who were all a great group. We also had a much more thorough orientation, safety drill and shark talk by the energetic and fun, Martin! After lunch on Day 2, we spotted Guadalupe Island. It was much larger than what I expected and seemed to have its own weather system as it was shrouded in a mysterious mist. We anchored not far off shore and this would be our stop for the next 3 days. On the shore, we could make out Guadalupe Fur Seals, Sea Lions and even Elephant Seals who come ashore to molt in the summer months. Smartly, they all seemed to stay on the beaches and rocks and didn’t venture too far into the sea. They were all pretty vocal throughout our stay. And, then it was time! Early in the morning, we suited up with our 6mm wetsuits (which we happily rented from the boat), hoods, booties and masks and got ready to descend for our first cage dive! I have to admit; I was equal parts scared and excited. Hector, our dive guide, helped us on with our weights and into the cage. He passed us our hose regulators and we were ready to descend. The visibility was truly amazing. Just looking at all the fish swarming towards the two tuna bait hunks was pretty cool, but then….we saw them! Two magnificent male great whites came into view and we all squealed with delight. They circled above and below and around the entire dive and made passes at the bait every once in a while. It was awesome and I was completely stoked. We dove twice more that day in the cage to about 30 feet and saw 2-4 sharks on each dive. We also hopped in the surface cage which was a thrill as we could really see them close-up going for the bait. There were 30 passengers on board and basically a third of them were non-divers so they went in the surface cages only. This is a great way to go as you do see loads of great action on the surface. Most of the non-divers were very satisfied and a lot of them said that they would definitely go for their certifications. Our 3 days were spent cage diving and surface cage diving and we saw lots of action on every dive except one. Not bad! In between, we checked out each other’s photos, shared tales, hit the hot tub, and relaxed in the lounge or top side. We also watched the seal action on the shore. Since I volunteer at the Marine Mammal Center in Sausalito, which is a hospital for sick and injured seals and sea lions, I was happy to see that they were not on the lunch menu while we were there. Everyone asks if it was scary and it wasn’t really. The sharks are fascinating to watch when you are in the cages as they circle around. These creatures have been around for a very long time so they are cautious. They do not go all Hollywood and bash into cages to try and eat us. Probably, the most exhilarating moment for me was our last dive on the surface. The sharks were super into the bait that afternoon and we were all clamoring to spend a lot of time in the surface cages. The crew made one of the submersible cages, a surface cage on the port side. We were in that cage when a shark circled around and then decided to zoom towards the bait. When they do this, their eyes roll back, their jaws gape open, those rows of gnarly teeth come into view and they go adrenalin mode to attack the bait. This happened when the bait was drifting towards our cage, so we got a great close up view of the attack. And then, after the shark took the bait, he swung around to get away and came right towards our cage and me! This was the first time that I jumped back in the cage, let out a girlie scream, and took a great picture of my foot. I cannot say enough good stuff about the boat and the crew and the food! The Nautilus Belle Amie was very comfortable and the staff were exceptional. They were able to achieve that rare quality of making you feel like part of the family while taking extremely good care of you. The food was terrific as were the margaritas. This was one of the best liveaboard experiences I have ever done – just a wonderful mix of terrific boat, crew, passengers and fish action. Late in the afternoon on day 5, we took our final shark dives and prepared to steam back to Ensenada. Three full days with the sharks was just the perfect amount. Since we couldn’t really do anything else (like swim, kayak or go on the island), the timing felt right for me. The entire time, we were the only boat out there, except for that day when the Nautilus Undersea showed up. This was fortuitous as we needed to borrow some of their bait. It was a longer (20 hour) crossing back to port and the seas were rocking and rolling. By now, most of us were completely bonded with the other guests and crew so the crossing was fun. We reached Ensenada in the afternoon and boarded our shark bus back to San Diego. Most of us went straight to the airport for our flights home. This trip was amazing; thank you Nautilus Belle Amie!